Wide, low-slung, muscular and ready to pounce - the 2012 C63 AMG Coupe Black Series cuts an impressive figure. From the very first glance, it is abundantly clear that the C63 AMG Coupe Black Series is made for spirited driving on a closed track. Visually reminiscent of the SLS AMG GT3 customer race car, the new high-performance vehicle stands clearly for technology adopted from motorsport - something that has been a core philosophy of Mercedes-AMG GmbH for 44 years. "AMG has its roots in international motorsport. The new C63 AMG Coupe Black Series showcases the ongoing transfer of technology from the race track to the road. Great success in the DTM, the customer sport program featuring the SLS AMG GT3 and our commitment to Formula 1, where we have been providing the Official F1™ Safety Car and the Official F1™ Medical Car for the past 15 years, are an ongoing source of inspiration for our engineers and technicians. The C63 AMG Coupe Black Series embodies the new AMG brand claim, Driving Performance, like no other AMG model", comments Ola KŠllenius, CEO of Mercedes-AMG GmbH. 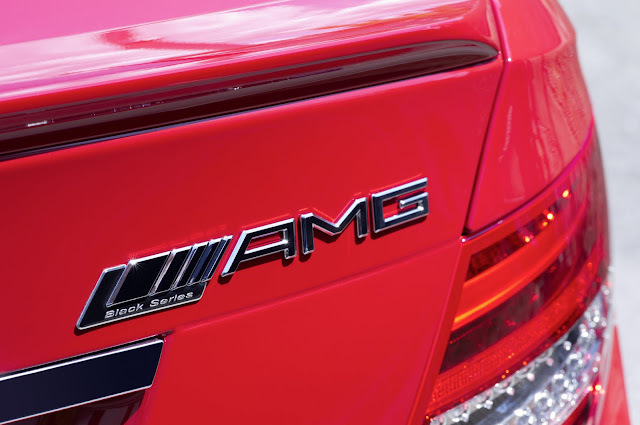 The AMG sports suspension is a sophisticated new development. Conceived as a coil-over suspension -- as is the norm in motorsport and a typical feature of Black Series models -- it offers a range of setting options, and allows the driver to create an individual set-up. Track has been widened by 1.57 inches (front) and 3.11 inches (rear). In conjunction with modified anti-roll bars, the C63 AMG Coupe Black Series delivers impressive dynamics, tenacious grip and minimal body roll. The AMG speed-sensitive sports steering facilitates superb vehicle control, with modified mapping of the power assistance for maximum steering precision. The most powerful C-Class of all time is the fourth Black Series model to be launched since 2006. The first one was the SLK55 AMG Black Series (not offered in the U.S.). The AMG 5.5-liter V8 engine in the thoroughbred two-seater boasted a maximum output of 400 hp and 383 lb-ft of torque. 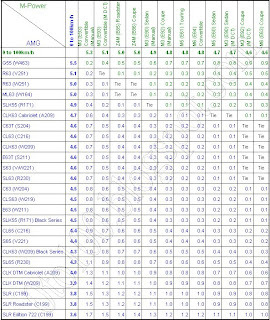 Just 120 units were produced between between July 2006 and April 2007. The CLK63 AMG Black Series followed directly in its footsteps. The two-seater coupe was powered by an AMG 6.3-liter V8 engine with 500 hp and 465 lb-ft of torque. Just 700 units of this very exclusive model were built between April 2007 and March 2008.